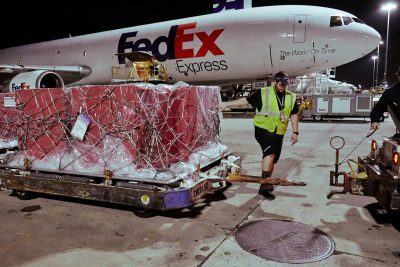 An airlift of International Medical Corps medical shelters and other lifesaving relief supplies departed the FedEx Memphis World Hub early this morning, bound for the Democratic Republic of the Congo (DRC), where a recent outbreak of Ebola has entered an alarming phase. Today’s shipment contains a total of nearly 30,000 lbs. of medical shelters and equipment, family hygiene kits to help reduce the spread of illness, and other relief supplies, which will be transferred to Ebola-affected areas by International Medical Corps. The medical shelters and accompanying equipment can be used for screening, referral, and isolation units in Ebola-affected areas and are part of International Medical Corps’ emergency field hospital, which is maintained at a warehouse in Memphis, TN, in collaboration with FedEx. In support of the DRC Ministry of Health, International Medical Corps’ Emergency Response Team is mobilizing a multi-disciplinary response to help save lives and contain the virus. This includes launching an Ebola training program for frontline healthcare workers, providing health facilities with the tools to fight infectious disease, and establishing screening, referral, and isolation units in Ebola-affected areas. International Medical Corps has extensive experience responding to Ebola and other infectious disease outbreaks. In 2014, International Medical Corps responded in Guinea, Liberia, Sierra Leone, Mali, and Guinea-Bissau. With a team of more than 1,500 tireless staff, International Medical Corps treated a total of 460 Ebola-positive patients and helped support longer-term efforts to prevent transmission of the virus, including training more than 5,000 health workers and administering screening and referral units that screened more than 670,000 people entering hospitals and clinics for symptoms of the virus.